Our universe is composed of an energy spectrum ranging from the subtle to the dense material forms. Consciousness, life, and matter manifest as differentiated forms of the same primordial energy that extends beyond time and boundary. It's the Source - known and unknown to us - the godhead. This energy coalesces to form powerful rhythms and rhythms within rhythms within rhythms - the heartbeat of the universe, the fingerprints of god. The structure of the known universe has been expressed in terms of quantum mechanics, discrete energy states - stochastic probabilities, non-discrete points -- interchangeable forms of energy as particle and wave function. Such conceptual metaphors begin to explain material existence to the rational mind and demonstrate our limited potential to understand it in the objective. Yet, beyond science and rational thinking is the frontier of what I call rational intuition - an area of understanding beyond knowledge. From there, I draw the following extrapolations in an attempt to rationalize purely intuitive realizations. We exist as a differentiated component of the universal energy spectrum. Matter, subtle energy life forms, and physical life forms are drawn from the same ocean and its tributaries. Life patterns resonate from universal harmonies. A Darwinian-type of selection takes place. Each energy tunes to a note in the harmony with mathematical precision. Conceptually, it seems reasonable to consider ourselves as chords in the universal symphony. Spirit (life energy) does not exist as a point, but rather a set of frequencies that form a matrix. It is the ego that locates and confines spirit to points in space and time. Thus, humans and other life forms are compilations of energetic forces that are both constrained within us and that flow through us. I believe this is the basis of what the Buddhists and spiritualists refer to as the "Oneness" - the energies flowing through from a single source. When we die, the ego dissolves and the constrained forces are released. However, the universal energies and subtle egoic fingerprints continue to flow. 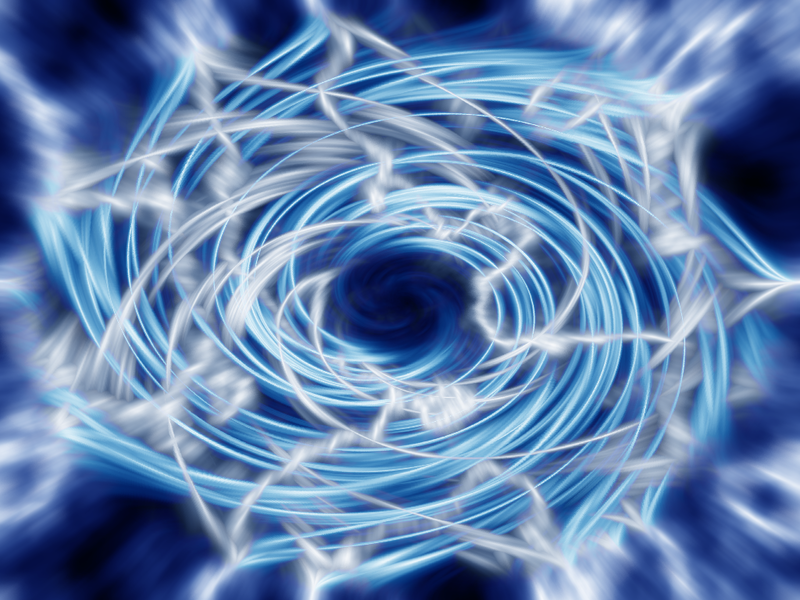 We recognize fundamental energetic patterns that are derived from outside and the egoic patterns that arise from within. We typically associate them with the personalities of the individual. Egoic energies adhere to patterns that are no doubt influenced by both the wiring of the brain and the flow of universal energy though us. Universal energies are more fundamental and likely account for the archetypes that are often superstitiously associated with both deities and demons. The energies can be channeled. We channel them at an unconscious level, calling them our own, and can learn to channel others at will. Several months ago, as I sat in meditation, I experienced myself to be John F. Kennedy. It wasn't the person -- I had no memory of his childhood, or the Whitehouse, and certainly not time spent with Jackie or Marilyn. But, I felt an energy that I associated with the JFK public image. Even though I typically feel little connection to the man, I resonated there and it seemed that I might act and respond to situations much as he might have done in his public life - it was only a small slice of what his actual life must have been. It was a bit like tuning a radio and finding myself unexpectedly tuned into the JFK frequency. Such an energy may be easiest to tune into as it is both a part of our collective unconscious and it is a frequency that resonated with our culture. Similarly, I might use Christ to describe certain high energies that flow through us. Thus, it may be that Christ is an archetypal energy. I presume (religious history is so distorted) that Jesus was a man who learned to tap into the Christ energy. I once realized such a high energy state in myself (see Bardo). Again, it's available to all of us - in fact, it feels very familiar when we dissolve the ego and clean our channels enough to permit ourselves to experience it. Behavioral patterns are a interaction of such metaphysical energies with the physical biology. Complex neuro-circuits are involved. The universal energies interact with each cell, each cellular complex and each molecular pathway. There are dark energies, too - energies of the personae as well as dark archetypes. We feel them in ourselves and we identify them readily in others. I don't want to go astray into dualistic concepts, but we should further realize that dark and light are part of the same spectrum. Without dark, there can be no light. We are all tapping into our unique spectrum of discrete energies. As we evolve, we find that we have greater and greater control over which notes comprise the chord that constitutes our essence - in the material realm, humans more than animals, animals more than plants, plants more than prokaryotes, prokaryotes more than matter. Now, with biological intelligence, we humans can begin to tune the notes of our instruments. With our rational minds, we were able to shape our world. As we learn to tune the rational mind, we can shape our universe. We can transcend our lower instinctive impulses; we can begin to extend with our rational minds that which was available only to the intuition of our species. Both come into focus. Finally, we balance intuition with reason, embrace the universal harmony, and evolve to a new spectra of life form.